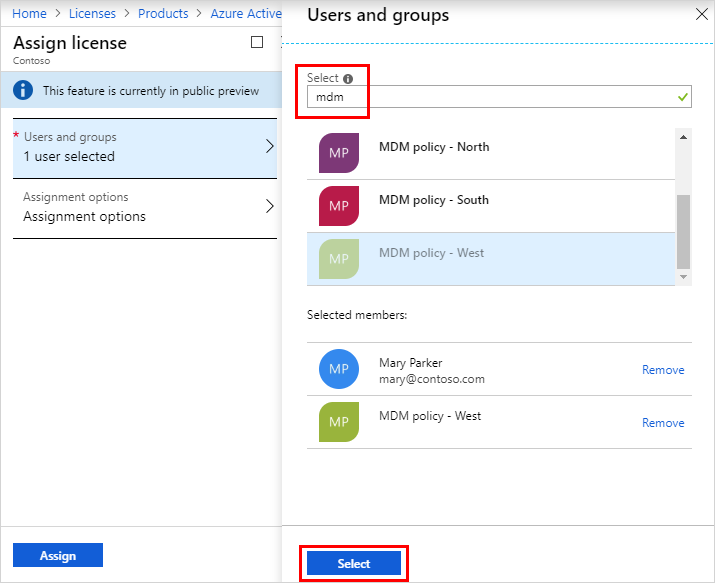 Many Azure Active Directory (Azure AD) services require you to activate an Azure AD product and to license each of your users or groups (and associated members) for that product. Only users with active licenses will be able to access and use the licensed Azure AD services. There are several editions available for the Azure AD product. For specific information about each product edition and the associated licensing details, see What license do I need?. You can view your available products, including the individual licenses, checking for any pending expiration dates and the number of assignments available. Select Azure Active Directory, and then select Licenses. Select the Purchased products link to view the Products page and to see the Assigned, Available, and Expiring soon details for each specific product edition. Select a product edition name to see its licensed users and groups. Make sure that anyone needing to use a licensed Azure AD service has the appropriate license. It's up to you whether you want to add the licensing rights to individual users or to an entire group. For detailed information about how to add users, see How to add or delete users in Azure Active Directory. For detailed information about how to create groups and add members, see Create a basic group and add members. On the Products page, select the name of the edition you want to assign to the user. For example, Azure Active Directory Premium Plan 2. On the Azure Active Directory Premium Plan 2 page, select Assign. On the Assign page, select Users and groups, and then search for and select the user you're assigning the license. For example, Mary Parker. Select Assignment options, make sure you have the appropriate license options turned on, and then select OK. The Assign license page updates to show that a user is selected and that the assignments are configured. Not all Microsoft services are available in all locations. Before a license can be assigned to a user, you must specify the Usage location. You can set this value in the Azure Active Directory > Users > Profile > Settings area in Azure AD. The user is added to the list of licensed users and has access to the included Azure AD services. On the Assign page, select Users and groups, and then search for and select the group you're assigning the license. For example, MDM policy - West. Not all Microsoft services are available in all locations. Before a license can be assigned to a group, you must specify the Usage location for all members. You can set this value in the Azure Active Directory > Users > Profile > Settings area in Azure AD. Any user whose usage location is not specified inherits the location of the tenant. The group is added to the list of licensed groups and all of the members have access to the included Azure AD services. You can remove a license from either a user or a group from the Licenses page. On the Licensed users page for the product edition, select the user that should no longer have the license. For example, Alain Charon. On the Licensed groups page for the product edition, select the group that should no longer have the license. For example, MDM policy - West. Licenses inherited by a user from a group can't be removed directly. Instead, you have to remove the user from the group from which they're inheriting the license.